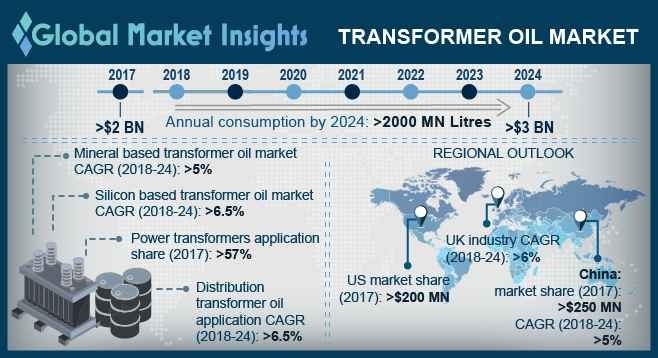 Transformer oil market size will exceed USD 3 Billion by 2024, as reported in the latest study by Global Market Insights, Inc. The China transformer oil market was valued over USD 250 million in 2017. Rising demand for the restoration of aging grid systems along with substantial fund flow for the modification of grid infrastructure will complement the industry landscape. In 2015, the National Energy Administration of China introduced its 5-year investment plan for the power grid construction & reformation. An investment of USD 302 billion was done to increase the length of the transmissions lines in the medium and ultra-high voltage areas.